Challah Bread Pudding with Kahlua Cream Sauce could also be named “The BEST bread pudding in all the world.” I am not even exaggerating. Toasted cubes of eggy challah bread are tossed with sweet cream, nuts, and raisins to create a bread pudding that attains otherworldly levels of taste. A cream sauce made with Kahlua and vanilla adds another layer of decadence that you have to taste to believe. Even if you decide to omit the rich and creamy Kahlua Cream Sauce poured over the top, the bread pudding is still spectacular. With or without the sauce, it’s undoubtedly the best bread pudding recipe I’ve ever made and everyone I’ve served it to agrees. Love this recipe? PIN IT to your DESSERT BOARD to save them! My sister Jenny made Challah Bread Pudding for us while we visited over the holidays and let me tell you, with no exaggeration at all, that this is hands-down the ultimate bread pudding. There were a few pieces left after we ate dessert. The next day, I very happily ate a slice without even adding the cream sauce; the bread pudding remained firm enough to slice but moist (without being even a tiny bit soggy). It’s filled with an abundance of warm spices that made it a sweet snack to enjoy with my morning coffee. To be honest, I have never been a big fan of bread pudding. Soggy bread is rarely a good thing and it takes some effort to find a decent bread pudding at most restaurants. If given the choice when planning a meal or eating out, I would typically choose cake, brownies, cookies, pie or scoop of ice cream for dessert over a bread pudding. This Challah Bread Pudding, though? It is a game changer. When it comes to taste and satisfaction, I’d put this dessert up against cake, cookies, or ice cream any day of the week. I’d gladly eat this for dessert (or breakfast or a snack) at any opportunity. Cubes of Challah bread are the perfect foundation for bread pudding. Challah is light and tender yet still sturdy. It absorbs all the delicious brown sugar and spice flavor without getting soggy or mushy. My first choice for this recipe is challah with raisins. If you like raisins even a little bit, I really recommend using raisin challah bread in this recipe. If you’re not a fan or can’t find any raisin challah, the recipe also works fabulously with plain challah. How Much Bread Do I Need? Loaves of challah can vary greatly in size so the key here is to measure the total amount of bread cubes. You’ll want approximately 12 cups worth of 1-inch bread cubes. Typically this is equal to about 2/3 of a giant loaf of challah bread or about 1 1/2 small loaves worth. If you wind up a little short on challah and can’t get another loaf, you can substitute another white bread you have around in a pinch! Just don’t use whole wheat bread; it won’t turn out the same. I have found that one of the keys to making good bread pudding is to use an immersion blender to beat together the eggs, sugar, butter, heavy cream and spices. This prevents any large pieces of egg from sticking together creating thick “eggy” pieces in the finished slices of pudding. While you do not have to use an immersion blender, I recommend trying it if you have one. 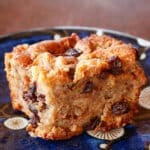 While the raisins in this recipe are technically listed as optional, my family would stage a formal protest if I left them out of my own homemade bread pudding. The chewy dried fruit in every bite adds a nice variety of texture and burst of sweetness. You’re welcome to omit the raisins if you must but I highly recommend trying the version of this Challah Bread Pudding recipe WITH the raisins at least once if you can! The first time I tasted this creamy bread pudding sauce, I thought I’d died and gone to heaven. 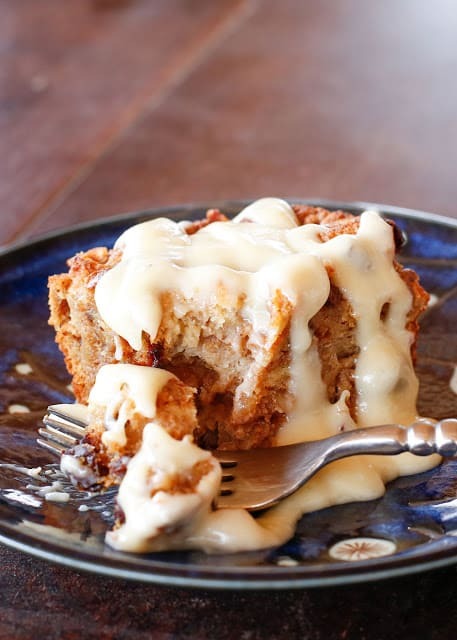 The dark coffee and rich rum flavors in the Kahlua coupled with smooth vanilla and heavy cream create a Kahlua Cream Sauce that is the perfect topping for bread pudding. While it adds a nice dimension to the sauce, the Kahlua is far from overpowering. All the flavor combinations are balanced just so to help heighten your bread pudding eating experience. That said, this sauce has plenty of flavor without the Kahlua. If you’d prefer not to use Kahlua in the sauce, you can skip it and add an additional teaspoon of vanilla to the cream sauce instead. 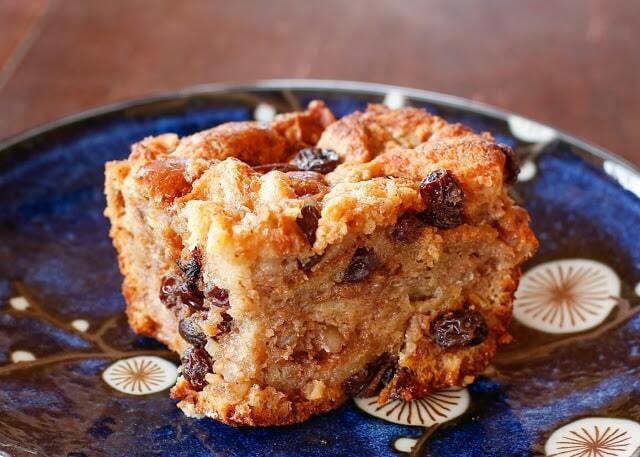 Are you a bread pudding lover already or do you usually pass it by in favor of another dessert? I promise you this recipe is NO ordinary bread pudding recipe; even if you’re usually less than enthusiastic about this kind of dessert, Challah Bread Pudding is likely to change your mind. 1. Preheat the oven to 350°F. Slice the bread into 1-inch cubes. You’ll need about 12 cups of loosely packed bread cubes. Spread the cubes across 2 large baking sheets. Lightly toast the cubes for 7-8 minutes, until dry and very lightly browned. Remove from the oven and let the bread cool completely. 3. Pour the toasted bread, nuts, and raisins into the liquid mixture. Stir for a few minutes, until the bread cubes absorb most of the liquid. Lightly mash the bread down with your hands, if necessary, to make sure all the bread cubes are soaked with the liquid. 4. Grease a 9×13 baking dish with butter. Pour the bread mixture into the dish. Cover tightly with foil. Bake for 80-90 minutes, removing the foil after 60 minutes, to allow the top to brown. The pudding is done when it is golden brown and springy to touch. The center of the pudding should be baked through and not at all liquid. Serve warm with Kahlua Cream Sauce. Preheat the oven to 350°F. Slice the bread into 1-inch cubes. You'll need about 12 cups of loosely packed bread cubes. Spread the cubes across 2 large baking sheets. Lightly toast the cubes for 7-8 minutes, until dry and very lightly browned. Remove from the oven and let the bread cool completely. Pour the toasted bread, nuts, and raisins into the liquid mixture. Stir for a few minutes, until the bread cubes absorb most of the liquid. Lightly mash the bread down with your hands, if necessary, to make sure all the bread cubes are soaked with the liquid. Grease a 9x13 baking dish with butter. Pour the bread mixture into the dish. Cover tightly with foil. Bake for 80-90 minutes, removing the foil after 60 minutes, to allow the top to brown. The pudding is done when it is golden brown and springy to touch. The center of the pudding should be baked through and not at all liquid. Serve warm with Kahlua Cream Sauce. Enjoy! Can I make this the day before? And what would be the best way to reheat to serve the following day?